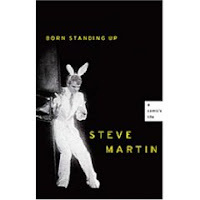 Having heard Steve Martin's book "Born Standing Up" spoken about in glowing terms on the Howard Stern Show, I decided to give it a read and... was not disappointed. The book is an autobiography of sorts about Martin's time in doing stand-up (was a distinct period of his life), but also has both some fascinating insights into his character as well as interesting asides that reveal how he views things. - The idea of Martin starting his entertainment career at age 10 working at the newly opened Disneyland. I couldn't help but be jealous of someone who basically knew from an early age what he wanted to do (even though he went from magic to comedy and then movies and writing)... course, I also give huge credit to someone who kept going after that despite adversity. - Tied to the notion above, Martin had a quote about his "lean" years that I loved... "Through the years, I have learned there is no harm in charging oneself up with delusions between moments of valid inspiration." - Martin's depression during his period of greatest stand-up success... right before he ended stand-up. - His reconciliation with his parents and corresponding reconnection with his sister. All in all, an interesting read for anyone who is either a fan of Martin or wants some insight into the show business world through someone that has been very successful in it.